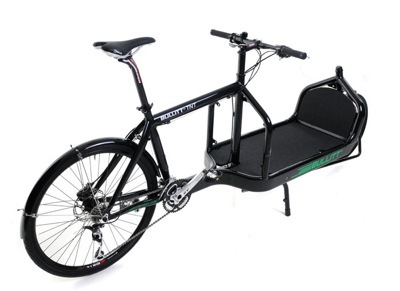 Danish company Larry vs Harry is producing the Bullitt, a “Long John”-style cargo bike. What sets this bike apart from many other long-wheelbase cargo bikes is the use of aluminium in large diameter tubes as opposed to steel. Much as I like the ride of a good steel bike, a cargo bike is a great opportunity to allow aluminium to shine, especially when a manufacturer can really engineer the shapes and diameters of tubing. A lot of cargo bikes are begging for some extra rigidity. 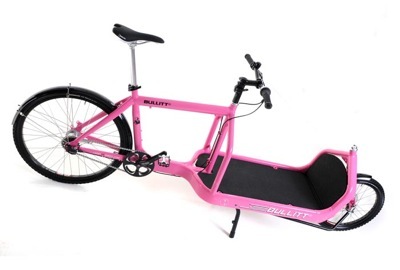 The Bullitt comes in 13 versions, with disc brakes and choice of internally geared rear hubs or derailleurs. The lightest version weighs 48lbs. As far as I can tell, there might be only one frame size, but I so want one. 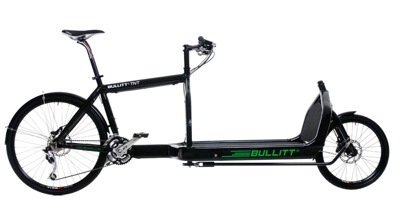 Larry Vs Harry bill the Bullitt as a performance cargo bike, and I’d be really keen to test that out. Unfortunately, I can’t find any indication that there is some sort of normalized North American distribution. Of course, if I had a Bullitt, it would only be a matter of time before I was attempting to mount dropbars.